International and national media recognition of the Paralympic Games pales in comparison to Olympic media coverage, but the more important story is the incredible trajectory of Paralympic media coverage. The growth in media coverage from the Rome Paralympic Games to the Rio Paralympic Games, both globally and from an Australian perspective, is staggering. Coverage from 1960 to 1972 was extremely limited in Australia, and elsewhere, with sporadic newspaper articles that mostly contained human interest rather than sporting stories. Lack of radio or television coverage, or even consistent newspaper coverage, made it very difficult for Paralympic sport to have any meaningful profile in Australia. This changed during the 1970s and early 1980s following the efforts of amateur filmmaker, Don Worley, whose hand-held films were edited, narrated, and shown by the Australian Broadcasting Commission (ABC). This was Australia’s earliest opportunity to watch sport for people with a disability on television. The ABC sent the first television crew to cover an Australian team to the Seoul 1988 Paralympic Games. Footage was aired during news broadcasts and in a post-games documentary. Through the 1990s, more newspapers wrote about Paralympic sport and the ABC provided extensive cross-platform support through its national television and radio network. Australian Paralympic performances were televised in prime time with daily bulletins during weekdays and extended bulletins on the weekend. 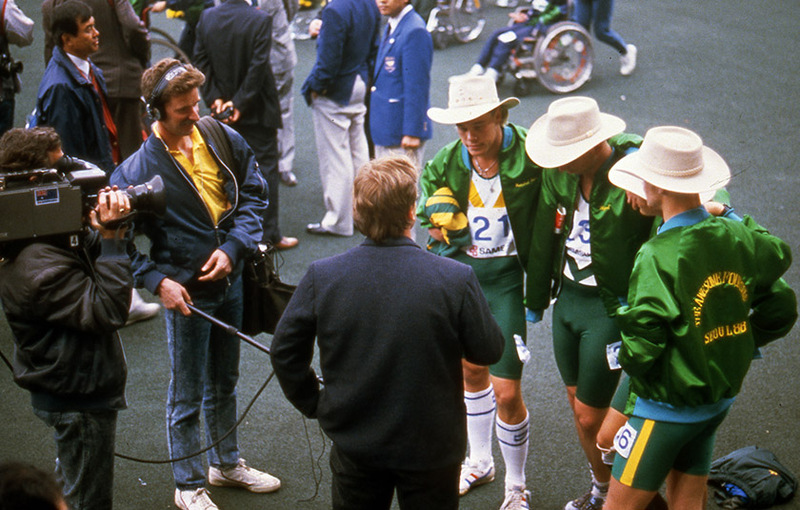 Television, radio and newspaper attention during the 1990s enabled Australians to identify with outstanding athletes like Troy Sachs, Priya Cooper and Louise Sauvage. The new millennium was a turning point in the relationship between the Australian Paralympic movement and the media. It started with the Sydney 2000 Paralympic Games. For the first time, Australians were exposed to live television coverage, accompanied by extensive radio and print media. The ABC telecasted both the Opening and Closing Ceremonies, and provided forty hours of live competition over seventeen days. The largest domestic Australian audience witnessed its team crowned as the top Paralympic nation. Media coverage diversified and increased during the first decade of the twenty-first century. The ABC extended its coverage of the Winter Paralympic Games with highlight packages during primetime viewing. By the Vancouver 2010 Winter Paralympic Games, the ABC had a crew of six that delivered ten hours of highlight packages for an Australian audience which doubled in size from four years earlier and, along with journalists from News Limited, Fairfax and AAP, represented the largest Australian media contingent at a winter Paralympic games. The media exposure of Summer Paralympic Games continued from strength to strength. For the Athens 2004 Paralympic Games, the APC negotiated separate media rights for television, radio and print companies. For the Beijing 2008 Paralympic Games, the APC had its own media team in Beijing and a support and coordination team in Sydney. For the London 2012 Paralympic Games, the APC extended its dedicated games website and extensively employed social media through Facebook, Twitter and YouTube. Consequently, exposure of the Australian Paralympic team was widespread. Media coverage – radio, television, press and internet – doubled in London 2012 in comparison to Beijing 2008, and trebled in comparison to Athens 2004. Following the London 2012 Paralympic Games, the APC ceased its long-term relationship with the ABC selling the media rights to a commercial company, Seven West Media. During the Rio 2016 Paralympic Games, the Seven Network televised 14 hours of live coverage per day on its digital channel, live website and mobile device app. The Seven Network reached 4.4 million television viewers and generated over 250,000 online streams. The most notable feature of Rio 2016 was the centrality of social media. It was through Facebook, Twitter and Instagram that people increasingly followed the fortunes of Australian athletes. In comparison to London 2012, online access for the Rio Paralympics increased by 400%. Recent Paralympic Games demonstrate the importance of the digital medium and related platforms in creating relationships between Australians and their Paralympic athletes.